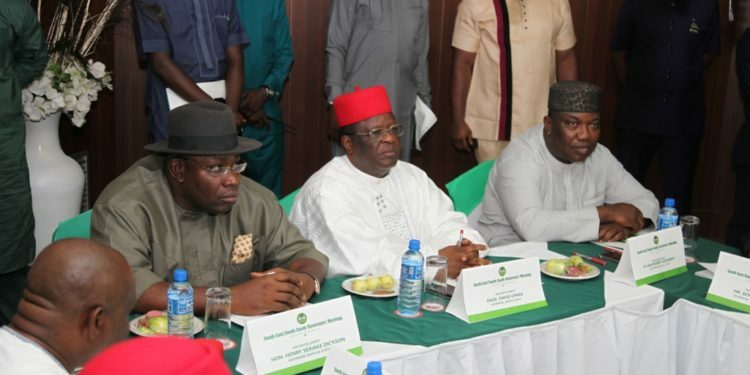 ‎Governors of the South-South geopolitical zone on Sunday in Enugu unanimously appointed Governor Henry Seriake Dickson of Bayelsa State as Chairman of the South-South Governors Forum. The appointment of Dickson came after a meeting the South- South governor‎s had with their South-East counterpart in the coal city state. Governor Dickson thanked his colleagues for the confidence reposed in him and called for the support and robust partnership of the Governors, leaders and people of the zone to reposition the South- South, a region with enormous resources, vast potentials and challenges! 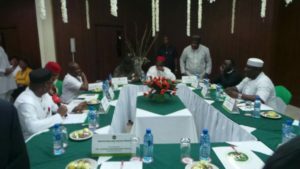 Governor Dickson has convened the Forum’s inaugural meeting in Port Harcourt on August 28, 2017. 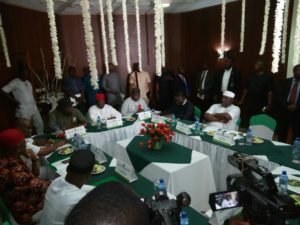 ‎At the combined meeting the South-South and South-East governors resolved to pursue inter-regional cooperation and integration for the economic benefit of the two regions and unity of Nigeria . The resolution, which was reached at the Nike Lake Resort in Enugu, the Enugu State Capital, had Governor Nyesom Wike of Rivers State, Governor of Cross River State, Prof Ben Ayade, his Abia State counterpart, Chief Okezie Ikpeazu, Owelle Rochas Okorocha of Imo State, while the Anambra State Governor was represented by his Deputy, Dr. Nkem Okeke. Others are Governor Udom Emmanuel of Akwa-Ibom State and the host Governor, Hon. Ifeanyi Ugwanyi of Enugu State, all in attendance. Delivering a 4-point communiqué to newsmen shortly after the meeting, Governor Emmanuel noted that, the governors agreed to work together and realign to strengthen the socio-cultural relationships existing between people of the two regions. According to Governor Udom, the inaugural meeting also unanimously endorsed him as the interim Chairman of the South-South and South-East Governors’ Forum, which comprises 11 states. He said the Forum reviewed the state of the nation, particularly the issues affecting the two regions and also fixed its next meeting for the 27th of August, 2017 in Port Harcourt, the Rivers State capital. Earlier in his opening remarks, the host Governor Ugwuanyi noted that, building a stronger inter-regional socio-economic and political bloc would provide the benefits of economies of scale and better economies of scale and attract both local and foreign investments to the two regions. 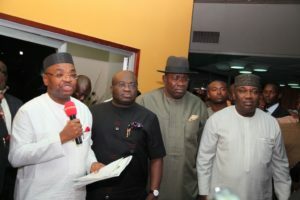 Governor Ugwuanyi, who canvassed the support of his South- south colleagues in the ongoing efforts to create a South East Development Commission, maintained that, effective inter-regional cooperation would enable the leaders command greater political capital to influence the decisions of the Federal Government for the betterment of their people. He urged the forum to speak with one voice and appealed to the Federal Government to review its borrowing plans from the China EXIM Bank for a railway development, with a view to including the Eastern railway corridor, which runs across the South-South, South East, North Central and terminates in the North East.